Firstly, place the food on the grill to start cooking and "mark" it. It does make a difference which side of the food goes onto the grill first. The best looking, or "presentation" side always goes face down on the grill first. Once the item is turned to the second side, it should not usually be turned again. Most diners expect to see the familiar cross-hatch marks on grilled food at a restaurant. While it is certainly possible to grill foods correctly without giving them the trademark "grid", it is not difficult to do. It has the added advantage of "releasing" the food from the grill before the presentation side sticks and tears. To mark foods on a grill or broiler, gently work the spatula under the food and give it a quarter turn (90oF/32oC). Let it continue to cook on the first side another minute or two before turning the food completely over. Whenever a barbecue sauce is used, it is usually a good idea to apply several thin coats, rather than one heavy coat. The more light coats, the better the finished color, flavor, and appearance of the food. Once the first side is done, turn once to cook on the second side. Since most foods cooked by grilling or broiling are relatively thin and tender, they should not require much more cooking time, once they have been turned. Thicker cuts, or those that must be cooked to a higher internal doneness may need to move to the cooler portion of the grill, so that they don't develop a charred exterior. Or, they may be removed from the grill altogether and allowed to finish cooking in the oven. For banquets, it may be helpful to quickly mark foods on the grill, just barely cooking the outer layers of the food. Then, they can be laid out on sheet or pans, and finished in the oven. This allows you to greatly expand the potential output of your grill. Exercise extreme care in chilling the food quickly if it is to be held for any appreciable amount of time. If you are using a barbecue sauce or glaze, you will probably need to turn the item more than once, however. Brush barbecue sauce on the top of the food and turn it repeatedly, until a good shiny glaze and crust have developed. When finish to the desired doneness, serve at once. 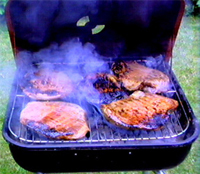 Most red meats, some fish, and duck breasts may be prepared to a range of doneness. Most other foods are cooked until they are cooked through. In either case, a deft touch and a sixth sense about when a food is properly cooked is a great boon to a grill chef. Rely on a combination of previous experience and sensory date - the way a food looks, feels, and smells - to guide you. Wash the fish inside and out and pat dry with paper towels. Cut 2 diagonal slashes into the thickest part of the fish on both sides. Place the peppercorns, chili and fish sauce in a food processor or mortar and pestle, and process or grind until a paste is formed. Brush the paste lightly over the fish, cover and refrigerate for 20 minutes. Heat the barbecue until very hot; lightly brush it with oil. Cook the fish for 8 minutes on each side, or until the flesh flakes easily when tested. While the fish is cooking, heat the oil in a frying pan; add the onion and cook over medium heat, stirring, until golden. Add the ginger, garlic and sugar and cook for 3 minutes. 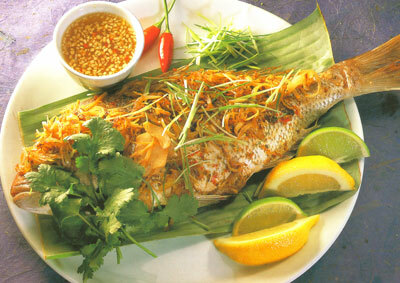 Place the fish on a serving plate, top with the onion mixture, sprinkle over the spring onion and serve immediately with lemon and garlic dipping sauce and hot steamed rice. Subscribe this FREE newsletter and get a FREE eBook.